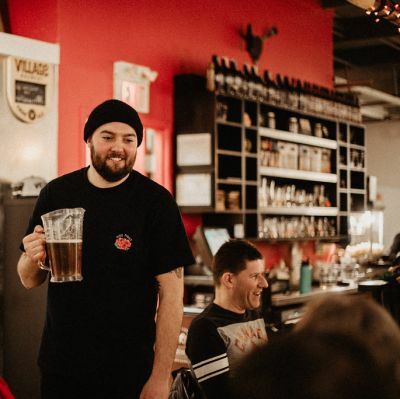 Village Brewery was founded on the premise of supporting community and the artists and craftspeople within it. When we're not making award-winning beer we're getting our hands dirty and diving into as many local initiatives as we can. You can find us on tap at most bars/restaurants around town, pouring beers at local festivals, collaborating with local artists to design our packaging, and working with local charity's. Our tap room functions as an art gallery and live music venue where we collaborate with artists and showcase their amazing work. We host varying musicians throughout the year, and sometimes even let them make their own beer! We think beer is the social lubricant that brings everyone and everything together. It takes a village, after all. Roughly 15x10 stage area. Floor performance offering a very intimate house show feel. can accommodate bands with upwards of 6 members. 2nd story of a brewery with balcony overlooking brewing operations. 60 person inside capacity and 60 person patio capacity. Full PA system. Inquire about specific audio needs/requirements.